Jun Tariman will take over as anchor of Cebuano News beginning Monday. "Starting Monday @juntar will be the new anchor of #CebuanoNews on CNN Philippines," tweets Menchu Macapagal, who has been the program's anchor for the past three years. "I have decided to accept an opportunity to learn... to hone my skills as a correspondent on the field. I look forward to broadening my horizons. I am thankful for the opportunity." Macapagal will remain at the network and will begin working as a regular correspondent. The news comes just days after CNN Philippines marked its first year on air, and just over a month since the network reduced the program's airtime from thirty minutes to fifteen minutes. Tariman, who is the head of regional news operations, is also the executive producer of the country's only national newscast in Cebuano. He joined the network in 2013 back when it was still known as Solar News Channel. He has since then led the program through its many incarnations. 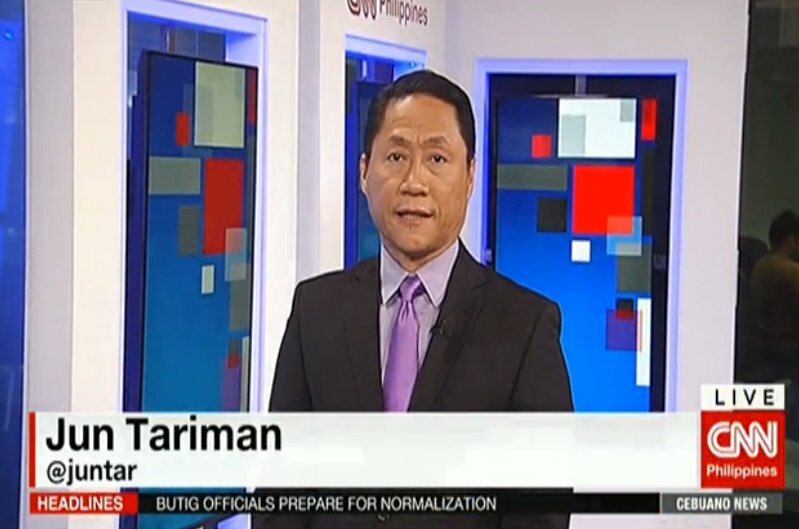 Previously, Tariman served as sci-tech commentator and as a news manager from 2000-2003 for ABS-CBN Channel 2.